Marblehead, MA – From scary monsters to swashbuckling pirates, the Marblehead Little Theater’s upcoming children’s workshop offers a creative alternative for next week’s school break. The program is for children by children, where the kids get to write their own adventure. From February 22 to the 24th, the Marblehead Little Theater will host the four-day workshop for children ages 6-12. They’ll be working on different aspects of theater including playwrighting, character development, singing, dancing, and acting. “It’s a pretty intensive theater workshop,” said Lynda Johnson, 54, of Lexington, MA, the artistic director who’s been with Marblehead Little Theater for the past five years. Johnson also said that by the end of the four days, the children will perform a play they’ll have written for their parents, work with set design, make their own props and learn what happens backstage. While it only started last year, this is the fifth session of the “Let Your Imagination Run Wild” workshop. Ginny Morton, 68, program director, said they realized children needed something to do during school vacation. The main focus of the workshop is to provide a glimpse of what theater involves, but it also builds teamwork skills. For many of these children, it’s the first time they’ve worked as part of an ensemble. “My first goal is to achieve community and bring the kids together as a group,” said Johnson. With ages spanning from six to twelve years old, the children engage on different levels with the material, which Johnson and Morton tailor specifically to their age needs. “Whether you’re six or twelve, it’s a very fun experience,” said Johnson. Kathy Beurer, 46, of Marblehead, whose eight-year-old daughter, Lucia, has been with the theater for two seasons, said one of the most impressive features of the children’s workshop is the attention and care it provides. 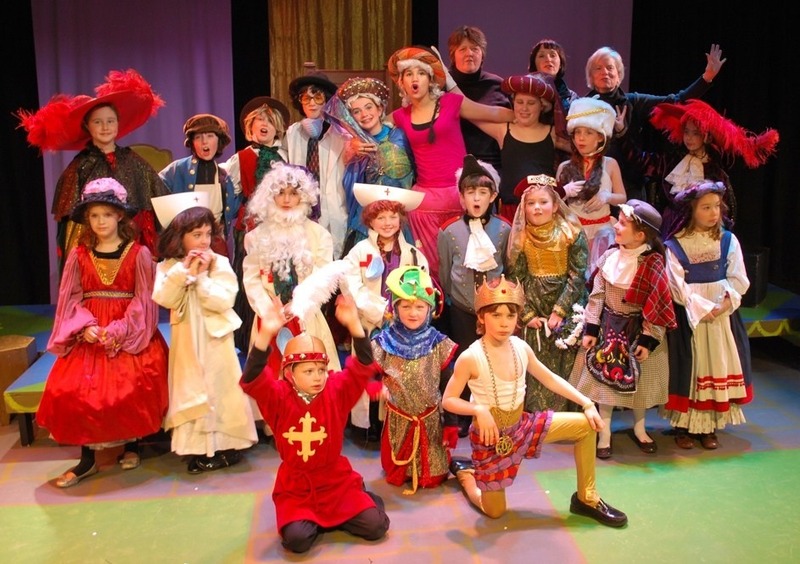 The children get to use their imaginations and choose everything from the theme of the play to the choreography. They’re the writers. It’s an opportunity to explore the arts more than what’s offered in school. And at the end of the four days, they get to stand on stage and show their work to Mom and Dad. The workshop is divided into two sections: 9 a.m.-1 p.m. or 9 a.m.-3 p.m. For members of the theater the cost is $250 dollars. For non-members, it’s $280. Very useful content, I really enjoy reading it. suffering patients lead normal lives. Created by Ricky Everret,But Search Engine Optimization isn’t just about tweaking a website. It’s about creating manual backlinks for your website. Its nice article post! The children get to use their imaginations and choose everything from the theme of the play to the choreography they’re the writers. It’s an opportunity to explore the arts more than what’s offered in school. Thanks for giving information. Nice post, right to the point. Really very good activity theather little. microsoft support number always provide support of Microsoft customer and provide the solution at a minimal price. Microsoft has very professional assistance to solve Microsoft technical issues through Microsoft support number. The Bridal Shower Memory Game is also very popular. The typical way to play this game is to have a tray filled with various household items. Bring out the tray and allow the guests to study the items for a few minutes and then take the tray away and ask questions about the items such as, where the spoon was and what color was the spatula. Now if you're thinking that so far, this doesn't sound very festive, hold on - because the magic is about to begin. And, the more dramatic the better. If you always wear nothing but small studs or tiny hoops, here's a chance to wow colleagues with your style by choosing a dramatic pair of Boho chandeliers or a dressy crystal drop earring. A fun and relaxing antidote to this is yoga. dior bags price Yoga has been said to be the true fountain of youth! A good, long yoga session a few times a week or a simple practice of ten to twenty minutes daily can relax, tone and lengthen your muscles as well as your spirit. It also helps to de-stress your mind, which has been shown to have an effect on cortisol levels in the body. The burberry shawls on sale newest sensation sweeping proms around the nation! Fiber optic lights in your hair that sparkle like a rock star. What am I talking about? This is a new product called Glowbys. These are hair barrettes with small batteries and fiber optic lights. maivietsml xin giới thiệu tới các bạn những dụng cụ rửa xe như: máy nén khí hitachi và máy rửa xe gia đình và máy hút bụi công nghiệp cũng như máy rửa xe cao áp. Ngoài ra, các bạn cũng có thể tham khảo bình bọt tuyết giá bao nhiêu và giá cầu nâng 1 trụ cũng như xem dung dịch rửa xe ô tô,xe máy loại nào tốt tại đây. I am very happy to know about Marblehead’s Little Theater For Children By Children, something that is new to me and very helpful too. I am very informed. With the most reliable and quality assignment writing help, all your challenges with doing various academic tasks shall be easy to handle. میخوام برای جشن عروسیم که دقیقا 1 ماه بعد هستش یه آرایشگاه عروس خوبی رو در نظر بگیرم اما تاالان چیز خوبی پیدا نکردم، البته ی سایتی رو دیدم که مطالب خوبی رو درباره پیدا کردن آرایشگاه عروس گذاشته و میخوام شماهم ایده هاتون رو بهم بگید. I love school braks also. Geek Squad Number is a toll-free helpline that can be dialed for device repair assistance. This number can be dialed in case you require instant help for your damaged devices. Call Geek Squad Number anytime to get solution. From logging into your account to make the changes in AT&T account setting, you shall receive all sort of AT&T email support service at Assistance for All. You can contact us at our toll-free number 1-877-916-7666, and receive the quick solutions of your problem in a cost friendly way. On the off chance that you are searching for the best Hdf White primer doors Suppliers in Noida, at that point visit Dzireplywood, as they are the best organization which offers or gives the Hdf White primer doors. The Best doctor for breast implant surgery in Dwarka is Dr. Ashish Bhanot who performs abdominoplasty for removing the excess fat and skin at AUM Clinics. Torment and firmness that begins from the neck and proceeds up to the lower back are called spondylitis. Dr. Arun Bhanot is one of the finest and Best doctor for spondylitis in gurgaon.